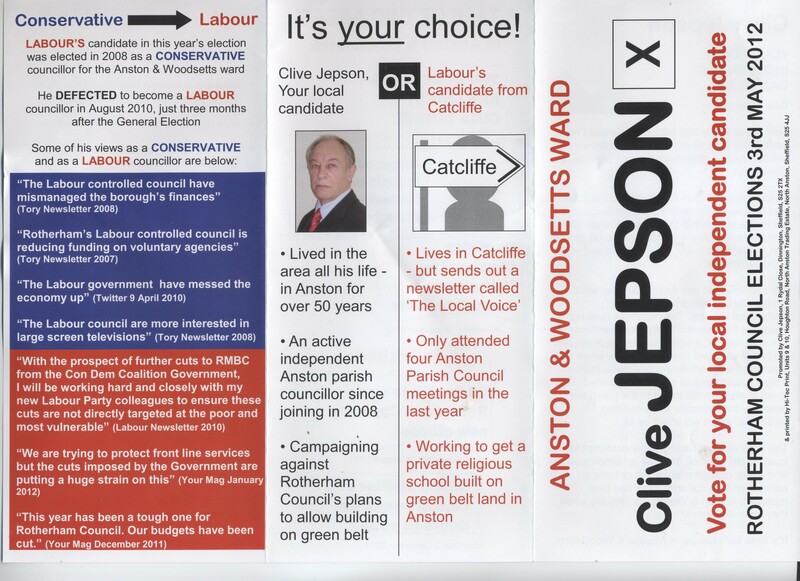 This entry was posted in Elections 2012 and tagged Anston & Woodsetts Ward, Clive Jepson, Darren Hughes, Darren the Deceiver, Darren the Defector, Dodgy Darren, RMBC, Rotherham Metropolitan Borough Council by Rik. Bookmark the permalink. Well done Clive! For exposing Darren’s duplicity! Selling your constituents down the river is not a good way to get re-elected. Dodgy Darren is well named! 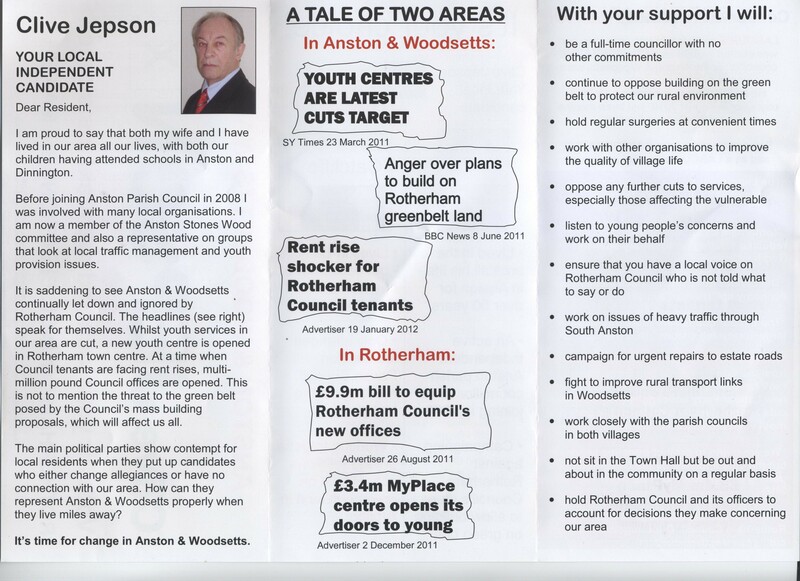 New and most amusing information on this particular campaign in Anston & Woodsetts coming in. Will post it, when story bottomed out. Come on guys, I thought you weren’t supposed to be supporting any particular political party or individual but here you are quite blatantly promoting Clive. To show your independence you should re produce Darren’s leaflet as well. Ps; not wanting to have an argument but just thought I would raise the point. Jaan, thanks for your comment. As a matter of fact I have already posted them together for comparison on Election Manifestos without comments in this section. Hope that clears that up! I would encourage all Candidates to submit their election addresses to Rotherham Politics for publication, I am sure it would be welcomed by Rotherham Politics readers and Rotherham Voters. It wouldn’t make any difference if you printed Darren Hughes leaflet or Simon Tweeds they are the same. Labour candidates are like pop stars on tour, the act is the same only the name of the venue is different. All the same information in the same order is on the back of the pamphlet the only thing that is different is the name on the front. Which proves my point party politics rule not the voters wishes. What should happen to shake them up is that Clive, as an independent for Anston and my self as an independent for Dinnington get voted in.